The Cosatto Ooba 3 in 1 Pushchair with new multi-terrain wheels allows you to escape the city with your little one and find your next adventure. 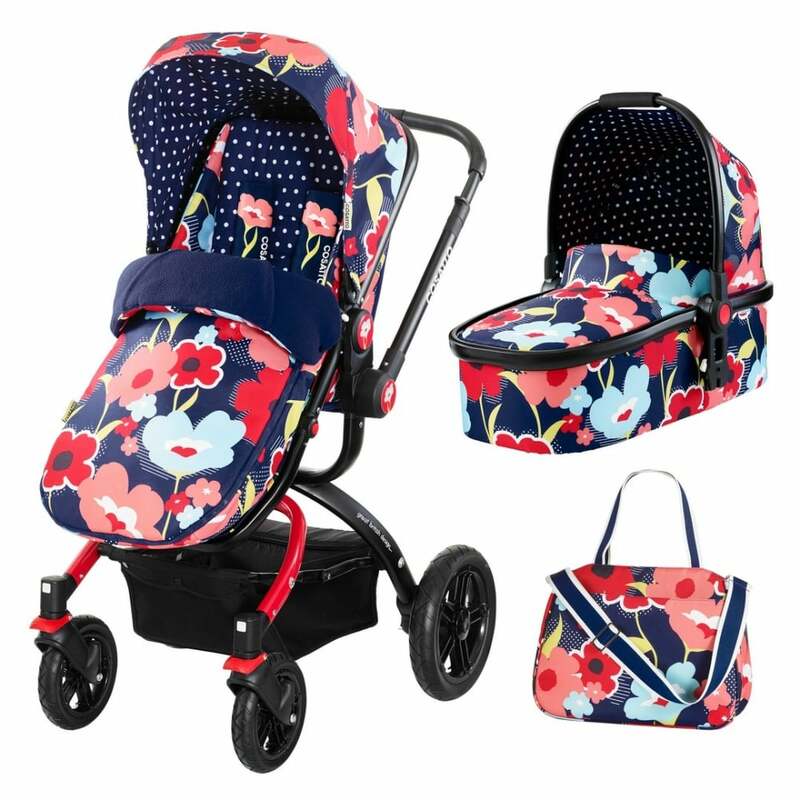 This chic pushchair has thoughtful details to make your life easier, while still looking great. Why should I choose the Cosatto Ooba 3 in 1 Pushchair? The Cosatto Ooba 3 in 1 Pushchair is suitable from 6 months+ (15kg/-3 year old) and has toy loops built into the hood to enable you to provide extra entertainment for your baby. The multi-position recline and adjustable calf support ensures comfort as your baby grows, and the 5-point safety harness also has height adjustable shoulder straps. The Duo Directional mode allows you to choose to have the seat facing inwards towards you, or outwards. There is also a raincover, a bumper bar and a 3-way cosy toes with reversible zip-off liner. The Carrycot of the Cosatto Ooba 3 in 1 Pushchair is suitable from birth as the comfy lie-flat bed is perfect for newborns. There is a carry handle built into the hood for ease and the included patterned raincover and UPF 50+ sunshade protection hood protects against the elements. The removable apron and washable liner make keeping the Cosatto Ooba 3 in 1 Pushchair clean so much easier. The lightweight aluminium chassis means it is easy to handle, compact, easy to fold and the all round suspension results in a smooth ride. The stylish leather handle is adjustable (99-108 cm) and there is a handle mounted brake for convenience, while the quick-release removable wheels are lockable too. The under seat basket provides extra storage, and the Cosatto Ooba 3 in 1 Pushchair also comes with car seat adaptors, changing bag with mat and messy bag, all for extra ease when handling so many things at once. The Cosatto Ooba 3 in 1 Pushchair is compatible with the Cosatto Port Car Seat. What are the specifications of the Cosatto Ooba 3 in 1 Pushchair? 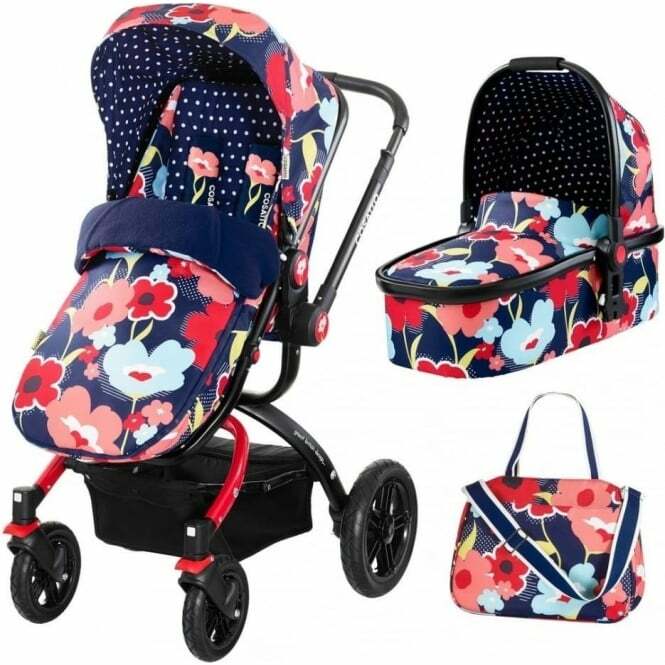 Is there a review for Cosatto Ooba 3 in 1 Pushchair? yes, a review of the Cosatto Ooba 3 in 1 Pushchair can be read here. Do I get a warranty with the Cosatto Ooba 3 in 1 Pushchair? Showing our 2 Cosatto Ooba 3 in 1 Pushchair reviews with an average rating of Array. Would you like to write a review? It's easy to switch between which direction the seat and cot face, and the wheels have made a real difference when walking compared to smaller buggies we've had. It's a very luxury product, and you can tell that every detail has been thought about, everything matches and we get compliments all the time! We purchased this after a friend had brought it let us play around with it. It included everything we seemed to need, and had so many different functions. Since using it, I can honestly say it's been the best thing we've brought since becoming parents. We don't need to worry about where we're going and our little girl looks ever so cosy inside. I'd recommend the ooba to anyone wanting an easy start to parenting!